The Top End of the Down Under city of Darwin is Australia’s tropical destination. Take a few days to enjoy the city’s laid-back ambiance with strolls along the esplanade, stop at the old Telegraph building to learn about the area. Each day at high tide the fish come to feed at AquaScene. For decades milk fish, catfish, and mullets show up for a free feed. Out in the water an occasional manta ray competes for attention by showing off its white belly. Most people use Darwin as a stopping point before heading off on “safari” into the area featured in the movie “Crocodile Dundee” - Litchfield and Kakadu National Parks. 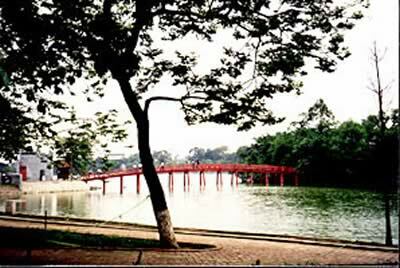 The area is a vast expanse of treed grassland cut by tumbling streams. Our Safari guide, Jonathan Mogridge, a Steve Irwin-type, picked us up and off we went on an Odyssey Safari making our first stop in Litchfield National Park. 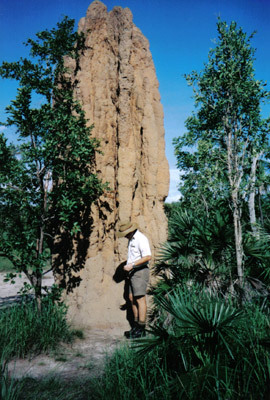 One stop was at a field of very impressive termite mounds. Some are like cathedrals, others are called magnetic and look like tombstones. There are so many it looks like a cemetery. 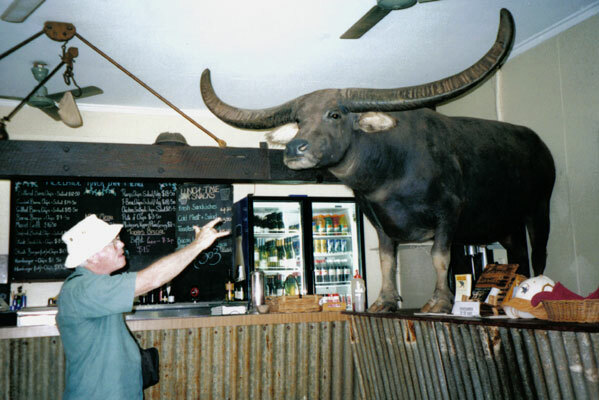 After a refreshing soak in one of the pools at Buley Rockhole, we head along Stewart Highway with a stop at Adelaide Inn in Adelaide River to see “Charlie” the water buffalo mesmerized by Crocodile Dundee in the movie of the same name. He has passed on and is now stuffed and stands proudly on the bar. Our final stop for the day was Pine Creek, an old Gold Mining town. In Kakadu, a World Heritage National Park the size of New Jersey, a boat takes visitors up the Yellow River, which during the Wet (December to March) is in flood stage so it is more like an inland lake. The scenery is beautiful but there nary a croc to be seen as they spread out over the flood plains during the Wet. However, visitors can stay inside a croc – the Gagasju Hotel in Jabiru, built in the shape of an 800-foot long crocodile. Nearby at Nourlangie Rock, a cave shelter, used for 20,000 years up until the 1960s, there is plenty of cave art. It is really quite impressive. Viewing the rock art in the cave visitors will develop an appreciation for the Aboriginal culture that is over 60,000 years old. The land is Savannah – a lot of grass and trees. The amazing thing is the animals seem to be few and far between. Sightings of dingoes, frilled lizards, wallabies and some really colorful birds are likely, however. From the Top End it is a three-hour flight south to the Red Center of Australia. The monolithic Ayers Rock, Uluru to the Aborigines, is one of Australia’s icons. The Songline Tour starts O’dark thirty in an upscale all-terrain vehicle bounds over the dirt road to a rise in the land. While the stars fade the guide cooks “damper” (wonderful tasting bread) over an open fire. While it is cooking the he relates Aboriginal stories, sketching in the sand to make a point. After the sun rises the reds of Uluru become brighter. A drive around Uluru follows as we look for scars in the rock that are part of the Storylines. 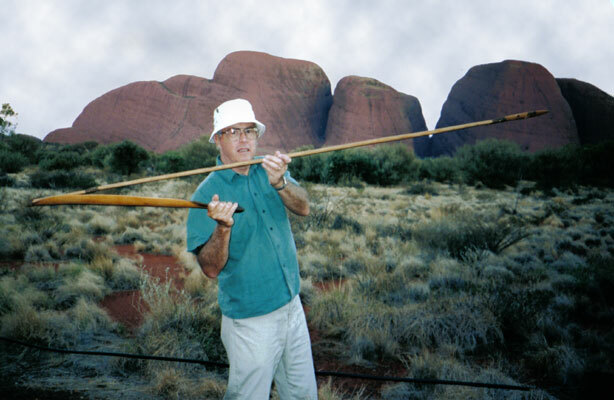 Hurried tourists often overlook another nearby sacred site - The Olgas, or Kata Tjuta, huge rounded pillars of red rock. It is an easy hike along the Windy Gorge Trail. An evening tour includes sipping champagne while watching the setting sun change the color of Kata Tjuta from brilliant red to dusky gray. The Spirit Ancestors, during Dreamtime, created Kakadu, Uluru, and Kata Tjuta. They formed all the earth’s features and when the world was finished the Spirit Ancestors turned themselves into rocks, billibongs (pools), and other natural features. 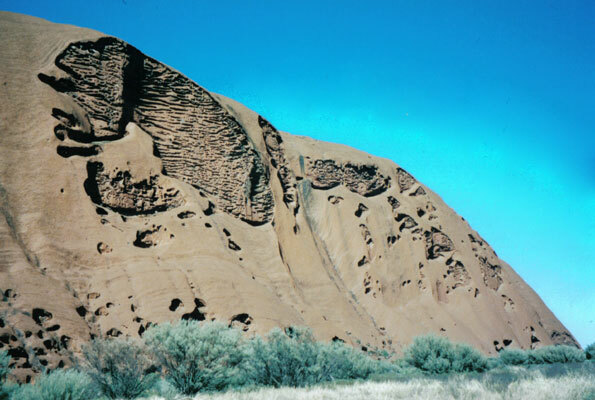 Consequently, Uluru is more than a big rock, it is sacred and contains Storylines that are intricate explanations of geology, mores, and history, plus provide a sense of continuity with the past. The Aboriginal rock paintings are like blackboards where the Songlines were taught, some date back thousands years. To climb the sacred Uluru is to go against the wishes of the Aboriginals. After leaving Ayers Rock, a three-hour bus trip with a change of buses at a dusty spot along the way, brings one to King’s Canyon in time to watch the setting sun turn the mountain range a brilliant red. The cabins have Jacuzzis with picture windows looking out on the rocky outcroppings. There is time for a morning hike to “The Garden of Eden,” a spectacular, narrow gorge with 300-foot walls before heading back to Alice Springs to catch the legendary Ghan train. From the Red Center of Australia the legendary Ghan train travels arrow straight south for 20 hours though the barren and desolate Outback to Adelaide. 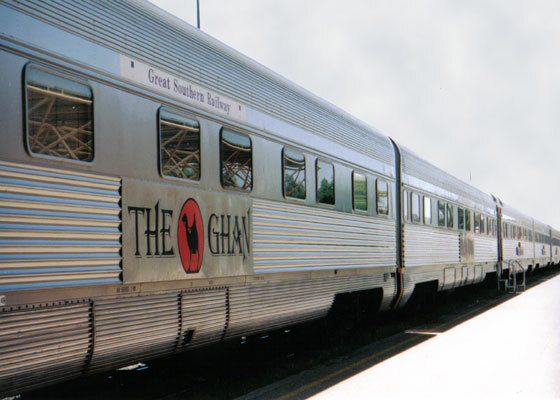 The Ghan is named for the Afghani-led camel trains that pioneered transport to the Outback. In Adelaide spend a delightful day touring the city and the seaside resort of Glenelg with a volunteer from the Adelaide Greeter program. It is a free program and a great way to end a trip from the top of Australia to the south. For more information check www.voyages.com.au, www.ecotours.com.au, or www.odysaf.com.au (prices on these websites are quoted in Australian dollars). Also, check www.nttc.com.au and www.australia.com or call (800) 369 6863.